Homeland Security 1 Edition Taking a comprehensive approach, HOMELAND SECURITY provides an overview of homeland security and terrorism. 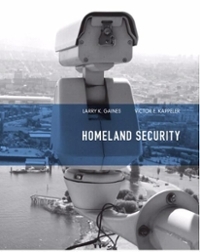 Organized in a four-part format, it examines the foundation for homeland security, homeland security and terrorism, defeating terrorists and their activities, and Homeland Security's response to terrorist threats. Each chapter includes key terms, discussion questions, marginal web links and HS analysis boxes that encourage students to think critically and analyze current problems inherent to homeland security and terrorism.